Published Aug 30, 2018 by Addison-Wesley Professional. 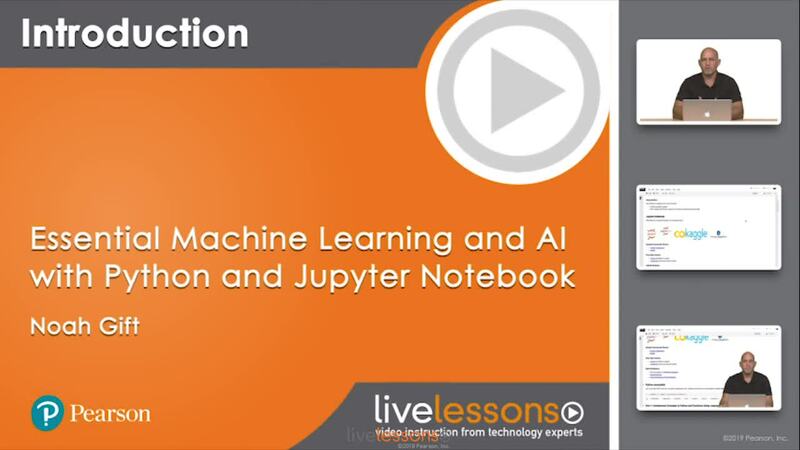 Learn just the essentials of Python-based Machine Learning on AWS and Google Cloud Platform with Jupyter Notebook. This 8-hour LiveLesson video course shows how AWS and Google Cloud Platform can be used to solve real-world business problems in Machine Learning and AI. Noah Gift covers how to get started with Python via Jupyter Notebook, and then proceeds to dive into nuts and bolts of Data Science libraries in Python, including Pandas, Seaborn, scikit-learn, and TensorFlow. EDA, or exploratory data analysis, is at the heart of the Machine Learning; therefore, this series also highlights how to perform EDA in Python and Jupyter Notebook. Software engineering fundamentals tie the series together, with key instruction on linting, testing, command-line tools, data engineering APIs, and more.